New Westminster’s fish bearing watercourses include the Fraser and Brunette rivers – home to salmonid and non-salmonid species. Localized water quality degradation (e.g. 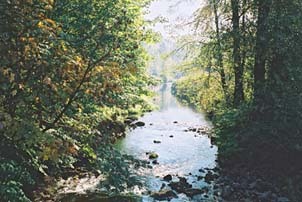 from contaminants) in and along or near upstream areas in the City and adjacent municipalities may affect aquatic life and limit fish production. Destruction and alteration of foreshore habitat and riparian clearing in and around watercourses (including a few in Queensborough) may limit the capability of these areas to support aquatic life and provide fish habitat. The City of New Westminster is committed to protecting or enhancing the quality of its water resources and encouraging water conservation with its citizens. Check out the programs and policies around water protection and conservation that the City is currently undertaking. Check out section 2.5 “Environment and the Riverfront and Climate Action” in the City’s OCP. Click here to go directly to section 2.5 of the OCP. Additional information about water conservation can be found on the Metro Vancouver’s website. Stage 1 of the Water Shortage Response Plan, regardless of weather conditions, applies from May 1 to October 15. Both Even and Odd addresses: Friday mornings, 4 a.m. to 9 a.m.
1. Newly turfed or seeded lawns, and those being treated with Nematodes may be irrigated more frequently, provided a permit stipulating conditions is first obtained from the Engineering Department at City Hall, Queensborough Community Centre or apply online after May 1st. Proof of purchase may be required to obtain a permit. Remember that, while exemption permits allow for additional watering days, watering is still restricted to 4 a.m. – 9 a.m.
No new permits are issued for watering newly turfed or seeded lawns in Stage 3 and Stage 4. 2. Hand-watering of flowers, shrubs and vegetable gardens is not affected by the regulations at this stage. 3. Car washing using a hose equipped with a spring loaded shut-off device is permitted. 4. Residents may water their lawn with water from rain barrels outside of permitted watering hours. Your cooperation will help save water and reduce the risk of more severe restrictions. Remember, your lawn only needs about 1-inch of water (about 1 hour of watering) per week to stay healthy. Sprinkling outside of the allowed days and times is subject to a fine based on the current stage of the Water Shortage Response Plan. If you require more information, please contact Engineering Operations at 604-526-4691. Thank you for your cooperation. The impacts of urban development can have large scale impacts to the natural environment and in particular to aquatic systems. In order to protect aquatic life from the impacts of sediment during land development and construction activities, the City implemented an Erosion and Sediment Control (ESC) Bylaw 7754. The regulation outlines acceptable water quality standards and requires proactive planning and the implementation of effective ESC best management practices by property owners and developers to mitigate the risk of sediment release. Building permit applicants for single family and duplex development are required to identify ESC measures that will be implemented. Applicants must complete and sign an Erosion & Sediment Control submission form for Single Detached/Duplex Resident Development. This ESC Best Management Practice Guide is helpful as a support document for the single family/duplex residential community. For larger development and sites other than single family/duplex development, builders/developers are required to complete and sign the ESC submission form for large developments. ESC requirements for larger development include the creation of an ESC Plan and the insurance that an ESC Supervisor is retained. ESC Supervisor commitment form can be found here. More information on ESC best management practices can be found in this Department of Fisheries and Oceans (DFO) document: Land Development Guidelines for the Protection of Aquatic Habitat. For information on city requirements related to concrete works and concrete washing activities during construction, please see this brochure. Fraser River and Brunette River: For development applications in these areas, a default 30 metre setback on both sides of the river (to top of bank) will be established. Development applications within the 30 metre setback will require assessment by a qualified environmental professional (QEP). Queensborough Ditches: Guidelines were created related to development and work activities around the various constructed watercourses on Queensborough. A number of ditches are subject to RAR (see map). For more information about RAR and development around riparian areas, please see our Riparian Area Regulation brochure (PDF). The province is providing a consistent approach to addressing the potential impact of residential, commercial and industrial activity on the riparian fish habitat. For more information on the RAR, please visit the BC Government website. Lawn and garden watering accounts for the largest portion of residential water use in the summer – water demand can be up to 60% higher in the summer than in the winter. Reducing water use for lawn sprinkling purposes during peak periods helps to ensure a sufficient water supply in the summer and can defer the need for system upgrades to the water supply infrastructure. In order to conserve our region's water supply, New Westminster supports Metro Vancouver's Water Shortage Response Plan by enforcing the region's sprinkling regulations. Check out Metro Vancouver’s “Tips for Water Smart Home & Yard Care" or the Rain Barrel Guide. You can do your part to conserve our region’s drinking water by storing rain to use for your plants and gardens. Did you know that lawn and garden watering accounts for the largest portion of residential water use in the summer? Water demand in the summer is up to 60% higher than in the winter because of outdoor uses such as watering plants, yards and washing the car. The City is providing to residents of New Westminster a 75 gallon plastic rain barrel for $75.00 including taxes. The rain barrels measure 54” high, 42” wide and 21” deep*; please ensure the vehicle transporting the rain barrel is large enough. This offer is for residents of New Westminster only. Please call Engineering Operations at 604-526-4691 during business hours (7:00am - 4:00pm) if you would like to order a rain barrel. Rain barrels may be in limited stock and residents are encouraged to call and check for availability. Payment for the rain barrel can be made by cash or cheque only, at time of pick-up. When rainstorms hit New Westminster, the combined sewers (sanitary and storm) in the city often do not have the capacity to carry all the wastewater from homes to the region’s treatment plants. As a result, sewage from the combined sewer overflows (CSO) unavoidably enters receiving watercourses – namely the Fraser or Brunette Rivers. The City of New Westminster has been replacing its combined sewers – an older type of collection system – with separate pipe systems (wastewater and stormwater). This process is a costly, long-range project that results in a replacement rate of only 1% annually. 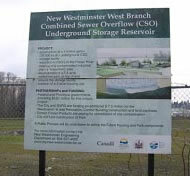 In 2005, the City partnered with Metro Vancouver (GVRD) in an initiative to create a tank (CSO tank) that would receive combined sewer overflows from the west end side of the City. The tank, which is a 20,000 cubic meter volume storage facility, was designed to address the CSO problem in that area by collecting large quantities of wastewater (e.g. during large rainfall events) and storing it until a time when the treatment plants can handle the additional load. This CSO tank aims to reduce combined sewer overflows in the City by 30%! CSO Building wins "green" award! Visit the Metro Vancouver website to watch a video on the construction of a CSO tank (Episode 21).